Dead Night Official Blog: Site updates and stuff. Just a couple of site updates! Sorry I havn't much news of other things, you got all that in my last post! So as you can see, there's been a bit of a re-vamp. 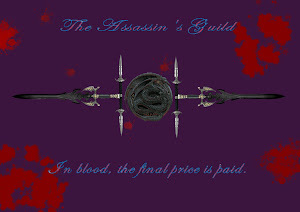 The old background was pretty but not fitting... in two ways, I mean...since my blog's width was expanded, it physically didn't fit... besides, birds don't have a fat lot to do with assassins. I liked the style of my old blog, which was quite a bit more Victorian, so it has been changed to the pattern that was originally that of the Cai-Terra Archives. If only it came in red! I am afraid that is all! I shall keep you posted on Dead Night and Lenora Lacey as I know things.